Tests for one proportion let you compare an observed proportion to a theoretical one. 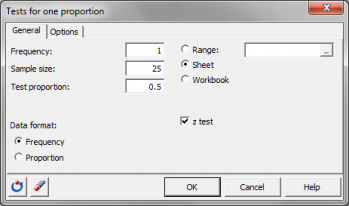 Available in Excel with the XLSTAT add-on statistical software. 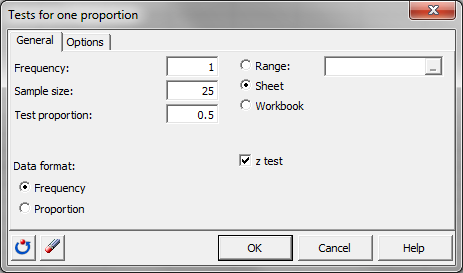 XLSTAT uses the z-test to to compare one empirical proportion to a theoretical proportion. Let n be the number of observations verifying a certain property among a sample of size N. The proportion of the sample verifying the property is defined by p = n / N. Let p0 be a known proportion with which we wish to compare p. Let D be the assumed difference (exact, minimum or maximum) between the two proportions p and p0. D is usually 0. The number of observations is large enough, and the proportions are neither too close to 0 nor to 1. The z statistic is asymptotically normally distributed. The larger N, the better the approximation. The p-value is computed using the normal approximation. Many methods exist to compute confidence intervals on a proportion. 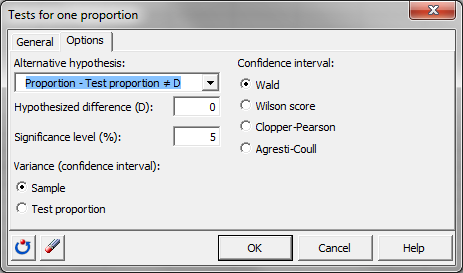 XLSTAT offers the choice between four different versions: Wald, Wilson score, Clopper-Pearson, Agresti Coull.